Displaying 56 Rosaries. If required you can use the filters above to narrow your search. Popular boy's first communion heirloom gift. 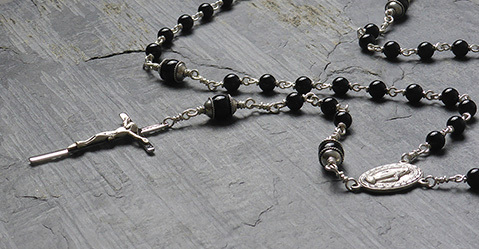 Black Agate Rosary with silver capped Our Father beads. 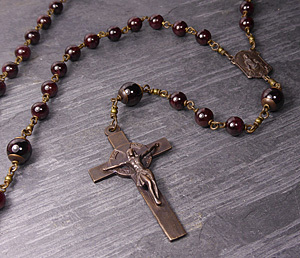 These Agate Rosary gemstones have a smooth surface and deep black colour having a sleek and sophisticated effect. Popular boy's first communion heirloom gift. Lapis lazuli is an ancient and rare gem steeped in history of the kind that might have come straight out of the Arabian Nights: a deep blue with golden inclusions of pyrites which shimmer like little stars. 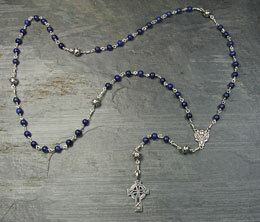 6mm & 8mm beads have been used to build this rosary, the 8mm Our Father beads are capped in detailed silver caps. Rosary built using 6mm beads with larger 8mm Our Father beads. 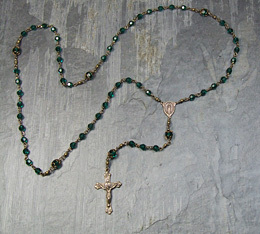 (a larger beaded rosary can be built on request). Moss Agate (also called mocha stone) is formed from natural volcanic rock. These moss agate gemstones are beautifully formed in multi-shades of green resembling moss and trees. This is a very special heirloom Rosary. First Communion Freshwater Pearl & Pink Kunzite Gemstone Bracelet wrapped in premium tarnish resistant argentium silver wire. All silver components apart from the argentium silver wire (please see below for description of argentium silver) are sterling silver. 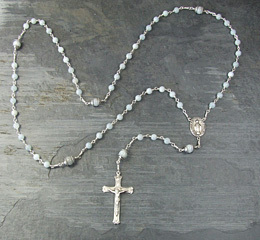 Angel Stone rosary built using 6mm beads with 8mm Our Father beads. Anhydrite is an opaque, blue and white crystal also known as angelite or angel stone. These angelite beads are a striking glacier-blue color with snow-white flecks. The name angelite comes from their angelic colour. Beautiful Light Sapphire Swarovski Cyrstal & Bronze Rosary built using 6mm crystals and larger 8mm capped Our Father crystals. 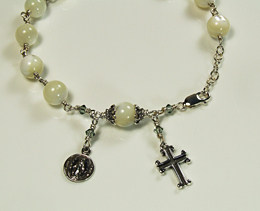 This rosary would make a lovely heirloom first communion gift. 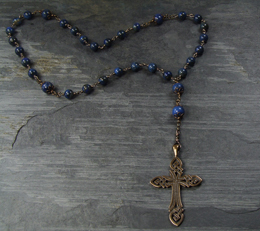 The Miraculous centrepiece and crucifix are cast from antique pieces then antiqued to restore original patina.The Our Father crystals are capped in brass open bead caps. A popular choice for First Communion and Christening. This elegant Rosary made with fresh water ivory pearls signifies purity and new beginnings. Lapis lazuli is an ancient and rare gem steeped in history. A deep blue with golden inclusions of pyrites which shimmer like little stars. Built using 6mm lapis laazuli beads & 8mm ornate sterling silver beads. Sterling silver thistle centrepiece, Celtic cross and Bali beads. 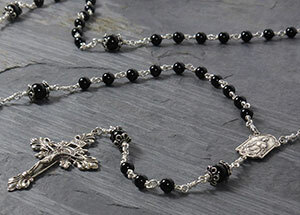 This is a beautiful Rosary made with deep black gemstones and silver capped Our Father beads. The cross is solid sterling silver and of exceptional quality, weighing approximately 4.8 grams. 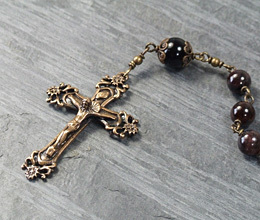 Rosary built using 8mm garnet gemstones & 10mm Onyx gemstones with antiqued brass bead caps. 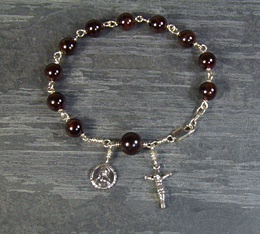 Garnet Rosary built using 8mm garnet gemstones & 10mm garnet Our Father beads. One of the world's most ancient gems, garnet has been treasured for thousands of years. Garnets were so called by the ancient Greeks since color reminded them of the pomegranate seed or granatum. 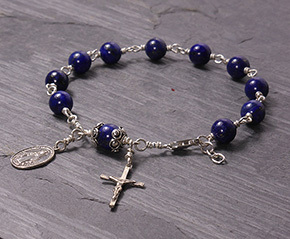 Lapis Lazuli & Sterling Silver Rosary Bracelet suitable for both men and women. Lapis lazuli is an ancient and rare gem steeped in history of the kind that might have come straight out of the Arabian Nights: a deep blue with golden inclusions of pyrites which shimmer like little stars. 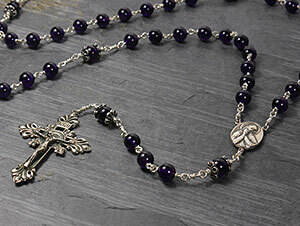 Rosary built with 6mm deep amethyst gemstones with 8mm Our Father gemstones capped in sterling silver. Built using 6mm beads with 8mm Our Father beads. Both the sterling silver centrepiece and Celtic cross are cast from antique pieces. The front of the centrepiece is Mary praying with the sacred heart of Jesus on the reverse. Poppy Jasper and Black Agate Gemstone Rosary built using 8 & 10mm beads. These Poppy Gemstones are a rich reddy brown colour with marbelled effect. The crucifix and centrepiece are cast from antique pieces then antiqued to restore original patina. A good choice for a girl's first communion for those looking for an heirloom rosary to be used later in life - built to last a lifetime. 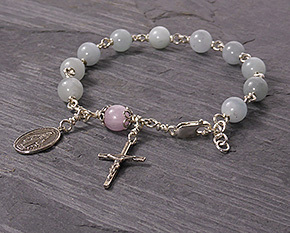 Built using 6mm aquamarine gemstone beads with larger 8mm sterling silver capped pink kunzite Our Father gemstone beads. 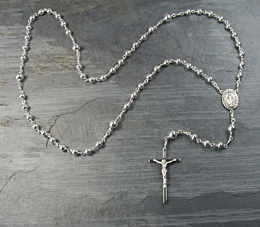 Both the sterling silver centrepiece and crucifix are cast from antique pieces. An elegant Rosary Bracelet made with fresh water ivory pearls signifies purity and new beginnings. 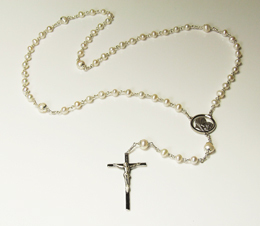 A popular choice for First Communion and Christening, this elegant Rosary made with fresh water ivory pearls signifies purity and new beginnings. 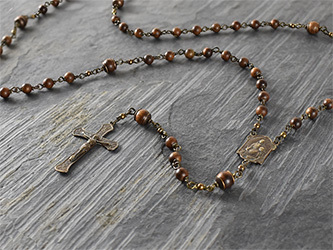 This Rosary has been carefully handcrafted using the traditional wire wrapping method. Each pearl is indidually wire wrapped in a swirl of sterling silver. The Father beads are capped in pretty sterling silver caps. ALSO AVAILABLE IN LARGER BEAD SIZE. Please email to enquire. A good choice for a boys first communion for those looking for an heirloom rosary to be used later in life - built to last a lifetime. 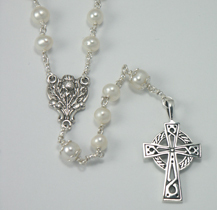 This elegant Rosary made with fresh water creamy white pearls signifies purity and new beginnings. 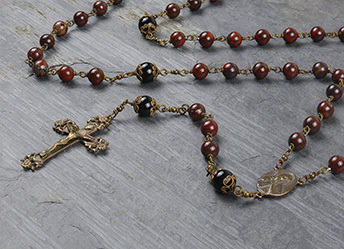 This Rosary has been carefully handcrafted using the traditional wire wrapping method. Each pearl is individually wire wrapped in a swirl of argentium silver. The Father beads are capped in pretty sterling silver caps. 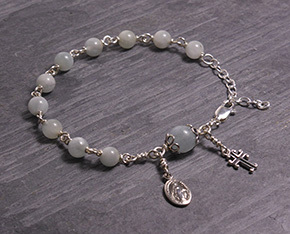 Aquamarine & Sterling Silver Rosary Bracelet. Aquamarine is classed as a precious gemstone, sometimes referred to at 'the gem of the sea'. Mainly pastel blue in colour - and with a beautiful sparkle, this gemstone is composed of emerald, aquamarine, heliodor and morganite. It is mainly found in Ural Mountains, Brazil and Siberia. 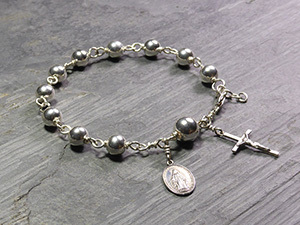 This Rosary is built using 6mm sterling silver beads with 8mm sterling silver Our Father beads. 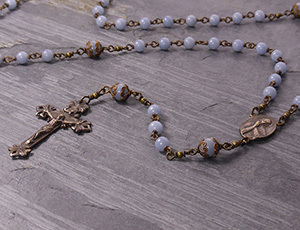 This Rosary has been carefully handcrafted using the traditional wire wrapping method. Each bead is wrapped in a swirl of sterling silver using traditional hand wrapping techniques which adds beauty to the finished piece. 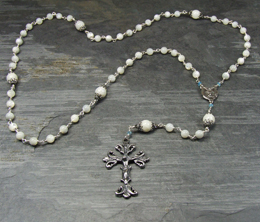 Deluxe Sterling Silver Rosary with Ornate Bali Beads. 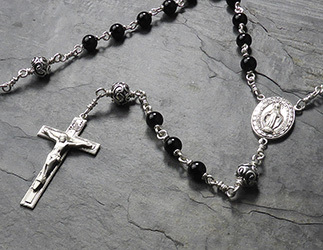 This Rosary is built using 6mm sterling silver beads & 8mm sterling silver ornate bali beads. 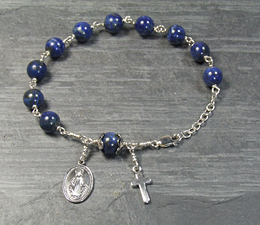 This rosary is also available in a larger bead size. All 8mm or 8mm with larger 10mm Our Father beads. Please get in touch if you require a larger bead size. 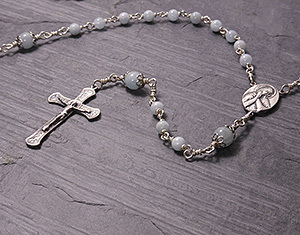 Beautiful heirloom aquamarine rosary with open sterling silver bead caps and antique cast sterling silver centrepiece & crucifix. Built using 6mm beads with 8mm Our Father beads. Ebony has a very high density, fine texture, and ability to polish very smoothly. The crucifix and centrepiece are cast from antique pieces then antiqued to restore original patina. 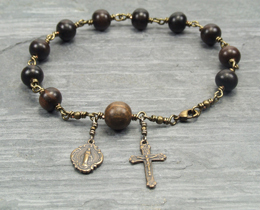 Our Father beads are capped in antiqued brass bead caps. 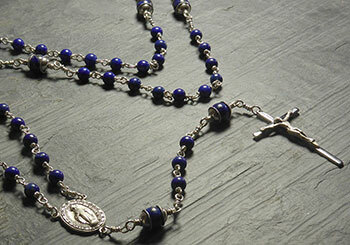 The Hail Mary beads are 6mm and Our beads are 8mm. 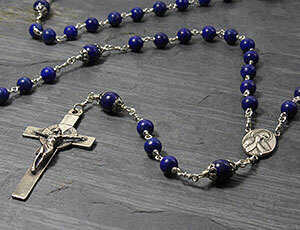 New model - Large Lapis Lazuli & Ornate Bali Sterling Silver Rosary. Lapis lazuli is an ancient and rare gem steeped in history. A deep blue with golden inclusions of pyrites which shimmer like little stars. Moss Agate (also called mocha stone) is formed from natural volcanic rock. These moss agate gemstones are beautifully formed in multi-shades of green resembling moss and trees. Tanzanite is relatively rare and costly, occurring in only one place in the world, the Merelani Hills in Tanzania. The crucifix and centrepiece are cast from antique pieces then antiqued to restore original patina. 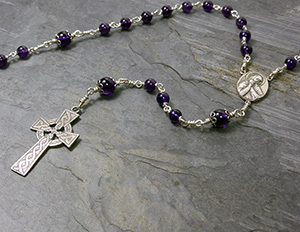 Amethyst & Sterling Silver Rosary built using 8mm deep amethyst gemstones. 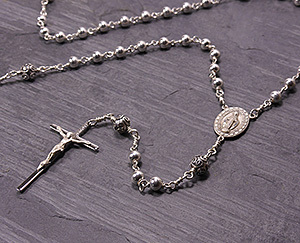 Both the sterling silver centrepiece and crucifix are cast from antique pieces. The front of the centrepiece is Mary praying with the Sacred Heart of Jesus on the reverse. The beautiful detailed Baroque crucifix is stunning. 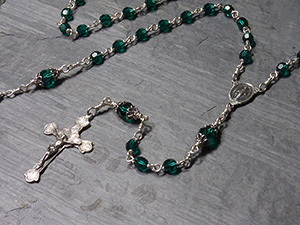 The parts on this rosary are much more substantial than the manufactured parts. 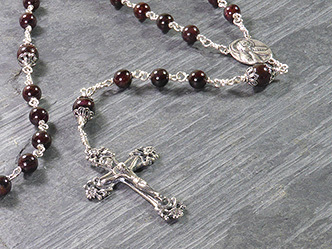 Large Garnet & Sterling Silver Rosary. Originally built for a man but also suitable for woman who prefer larger beads. The sterling silver crucifix and centrepiece are cast from vintage pieces then antiqued to restore original patina. 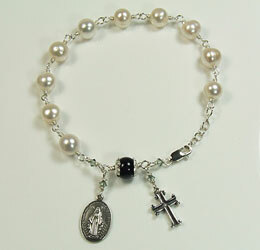 This elegant ladies Rosary Bracelet made with fresh water creamy white pearls signifies purity and new beginnings.The Black Agate Our Father bead is capped in pretty sterling silver caps. 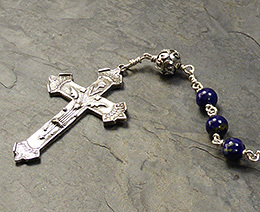 This Rosary has been carefully handcrafted using the traditional wire wrapping method. Each pearl is individually wire wrapped in a swirl of Argentium silver. 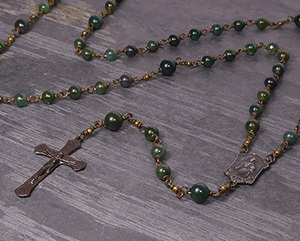 Beautiful Emerald Green Swarovski Cyrstal & Bronze Rosary. 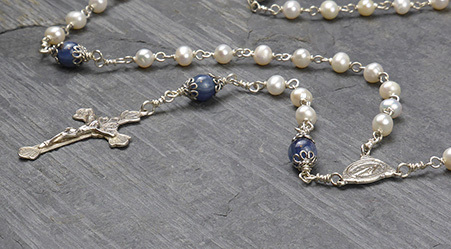 This rosary would make a lovely heirloom first communion gift. The crucifix and centrepiece are cast from antique pieces then antiqued to restore original patina. The Our Father crystals are capped in pretty open flower bead caps. This beautiful Swarovski Crystal Pearl Rosary is perfect for newborn gifts, Baptism and Christening. 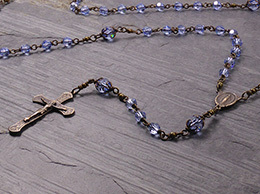 The boy's rosary has a baby blue swarovski crystal added. 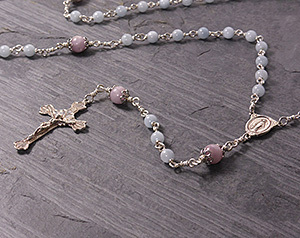 The girl's rosary has a baby pink swarovski crystal added. 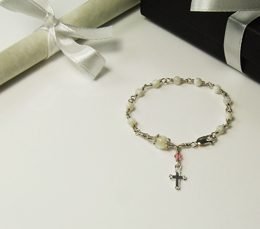 Beautiful Keepsake Mother of Pearl Rosary Bracelet, perfect for newborn gifts, Baptism and Christening. 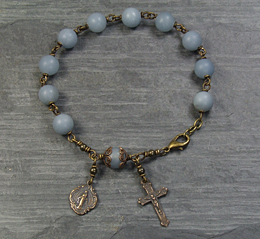 The boy's rosary bracelet has a baby blue swarovski crystal added. 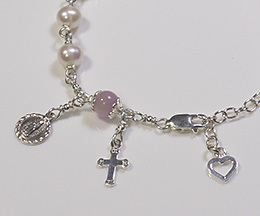 The girl's rosary bracelet has a baby pink swarovski crystal added. The crucifix and medal are cast from antique pieces then antiqued to restore original patina. 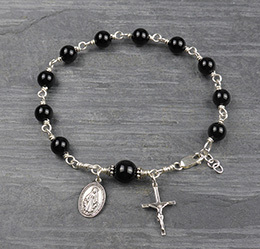 This Rosary Bracelet is built with 8mm deep black onyx gemstones. The 8mm Our Father gemstone is capped in ornate sterling silver bali caps. Sterling silver medal and crucifix. 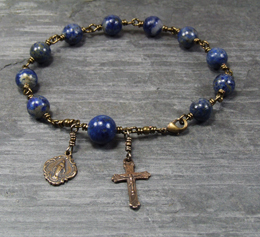 Rosary Bracelet built with 8mm natural lapis lazuli gemstones. Our Father capped in sterling silver Bali bead caps, with antique finish. Sterling silver medal and plain cross. 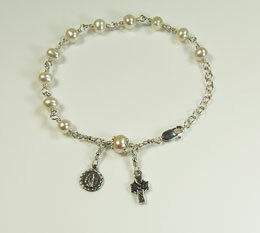 All Sterling Silver Rosary Bracelet. 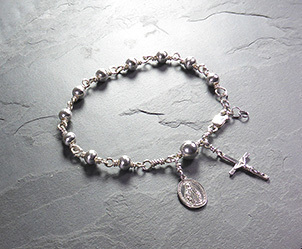 This Rosary Bracelet is built using 6mm & 8mm sterling silver beads and sterling silver crucifix and medal. 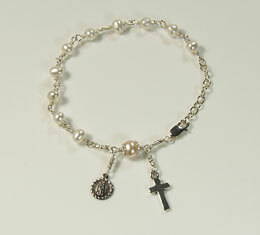 This Rosary Bracelet is built using 8mm & 10mm sterling silver beads and sterling silver crucifix and medal. Ebony is one of the most intensely black woods known, which, combined with its very high density, fine texture, and ability to polish very smoothly, has made it a very valuable ornamental wood. This particular Tiger (or striped) ebony comes from sustainable sources � many types of ebony are now a threatened species. 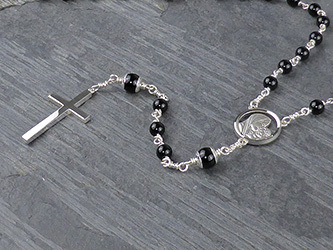 Black Agate Gemstone Rosary Bracelet with sterling silver cross and medal. This bracelet has been carefully handcrafted using the traditional wire wrapping method. Each gemstone is individually wrapped by hand in a swirl of sterling silver which adds a natural beauty to the finished piece. 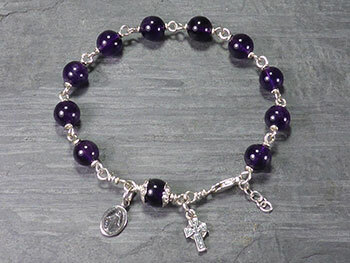 Rosary Bracelet built with 8mm deep amethyst gemstones with Our Father gemstone capped in sterling silver caps. Sterling silver medal and Celtic cross (optional cross available on request) with swarovski crystals. Mother of Pearl Rosary Bracelet wrapped in Argentium Silver Wire with Black Diamond Swarovski Crystals. 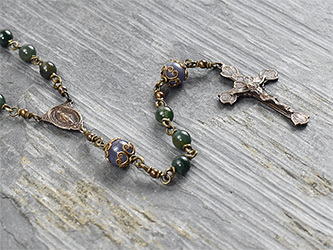 This Rosary has been carefully handcrafted using the traditional wire wrapping method. Each pearl is individually wire wrapped in a swirl of Argentium silver. The Our Father bead is capped in sterling silver ornate bail caps. 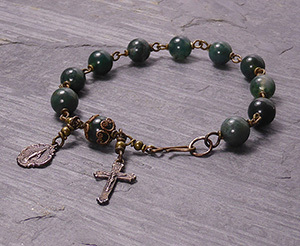 Moss Agate Gemstone Rosary Bracelet with sterling silver cross and medal. Moss Agate (also called mocha stone) is formed from natural volcanic rock. These moss agate gemstones are beautifully formed in multi-shades of green resembling moss and trees. 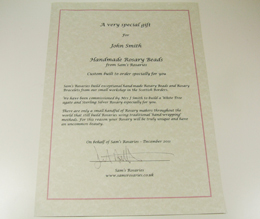 If you are thinking about a Rosary as a gift then we can offer the option of a personalised gift certificate for a custom Rosary hand-made especially for your friend or loved-one. You can either choose which Rosary to give, or else you can allow the recipient to pick out which stones, crucifix and centre they would like.